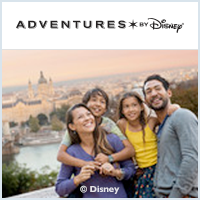 Family travel to Ireland with Adventures by Disney begins in Dublin before it crosses the Emerald Isle with stops in Killarney and Shannon. Experience the mirth and magic along the sweeping coastal cliffs, over the verdant rolling hills and among the ruins of ancient castles. Come create some family legends of your own! The dramatic Cliffs of Moher drop over 700 feet straight into the ocean. Hear the sound of crashing waves and marvel at one of Ireland's most magnificent views. Travel by horse-drawn cart through the lush, green countryside to the Victorian estate of Muckross House, where you'll enjoy a privately guided tour. Hike or bike through the picturesque gardens and waterfalls of Killarney National Park, a UNESCO World Heritage Site. Both an historic castle and a modern 5-star hotel, Dromoland Castle lets you live like the kings and queens of yore. Hike or bike the castle grounds as you enjoy spectacular views of the shimmering lake, lush forests and championship golf course. Explore the ruins of the Rock of Cashel—the ancient seat of Celtic kings and a spectacular example of Celtic stonework and medieval architecture. Enjoy a guided tour of the famed Guinness Storehouse®, where you'll be treated to lunch in a private dining room. During your stay in Dublin, you'll also visit the Trinity College Library to view the ancient Book of Kells, a breathtakingly beautiful illuminated manuscript created by Celtic monks around the 9th century. Explore historic Blarney Castle where you'll kiss the Blarney Stone. It is said that he or she who kisses the Blarney Stone will forever be granted the "gift of gab," the ability to speak with a clever and flattering tongue. After clearing customs, meet an Adventures by Disney representative. Relax as a driver assists with your luggage and whisks you away to the hotel! Unwind from your journey and explore the area that will be your home for the next few days. Learn about some of the nearby sights at the Adventures by Disney hospitality desk. Tonight, meet the other families that will share the adventure. Dine in a private room at the hotel and get ready for your quest across the Emerald Isle! Enjoy a privately guided tour where you will discover the city's dynamic history, go back in time on a private experience in the famed Jeanie Johnston ship, and taste the good life at the Guinness Storehouse®. You'll board an amphibious vehicle for a unique look at the city — on land and water! Enjoy a leisurely lunch at the Guinness Storehouse® and marvel at this seven story building that once housed a fermentation plant. Spend the afternoon with the family exploring historic Dublin – relax, shop or visit the amazing museums. Join our Adventure Guides for a peek at the ancient illuminated Book of Kells at Trinity College or take an independent walking tour of the Temple Bar neighborhood's cobblestone streets. Ask your Adventure Guides for more suggestions. Gather together for a family dinner on your own at one of Dublin's world-class restaurants. Your Adventure Guides will be happy to help you find the perfect meal! Travel across the emerald Irish countryside to the land of kings. Enjoy the scenic views as you journey to a picturesque town full of royal lore. Walk uphill to the ancient Rock of Cashel and explore the royal seat of the Kings of Munster. Wander the collection of medieval buildings crowning the hilltop of Tipperary's Golden Vale and learn about the imposing fortifications, spectacularly preserved guard tower and majestic Chapel of King Cormac. Then enjoy lunch in town on your own. Please note: Access to some areas requires the use of uneven walkways and narrow passages. Junior Adventurers can search for lucky shamrocks on the sacred grounds where Saint Patrick once stood. Journey to Killarney, where you'll stay in a charming family-run hotel in the heart of town. Share an evening with your family as you experience the music, shops, food and fun in the picturesque Irish town of Killarney. Who knows what treasures will be yours—you might just find the pot of gold at the end of a rainbow! Visit the Adventures by Disney hospitality desk for recommendations. Visit the most "spirited" locations of Killarney National Park as you explore abandoned castles and lakeside ruins on this chilling expedition to "the other side." Travel by horse-drawn cart through green fields to Muckross House, an historic Victorian estate that borders the picturesque lake in Killarney National Park, a UNESCO World Heritage Site. Join a local expert on a guided tour of this ornate and meticulously restored Victorian manor's 65 rooms. Then dine like Irish aristocrats in the garden restaurant of this glorious estate. Enjoy the idyllic splendor of this diverse landscape with a bike ride over gentle natural terrain or a stroll along the scenic lakeshore with your family. Enjoy a lively dinner in a traditional cottage featuring a festive atmosphere with authentic Irish cuisine and folk dancing. As you travel to County Clare you will make a stop along the way to explore Blarney Castle. Here you will have an opportunity to kiss the Blarney Stone and visit the gardens at this historic castle. Snuggled in a wooded setting among farmlands along the River Maigue is the quaint village of Adare. On your journey to Dromoland Castle we will stop in this charming town for lunch and a brief visit before heading to Newmarket-on-Fergus. This evening, adult travelers dine at the hotel's Fig Tree Restaurant located in the Golf and Country Club, while the Adventure Guides treat the kids to a night of food and fun and a classic Disney movie. *These activities are available at an additional cost. 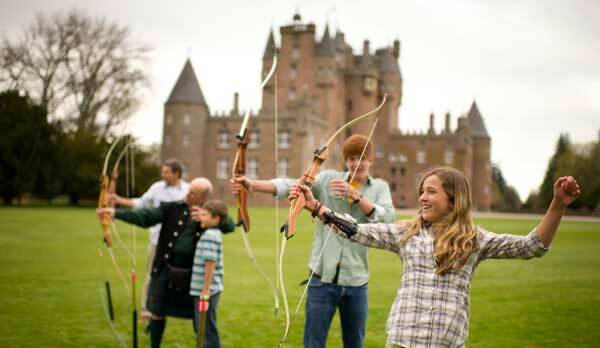 Join your fellow Adventurers for a private, late-morning tour of the castle grounds. See the timeless majesty of its great stone towers wreathed in creeping ivy, and the mystic beauty of its rolling green hills and gardens. Immediately after your private tour of the Dromoland Castle grounds, you'll experience the thrill of interacting with majestic birds as a falconry expert demonstrates this regional sport. Enjoy up-close encounters with not just falcons, but also hawks and owls. Revel at a merry dinner banquet filled with traditional Irish dancing and singing at an historic Irish castle. Devour authentic dishes and drink up! The musical medieval entertainment is sure to stir your soul and delight your senses. *Some of these activities are available for an additional cost. 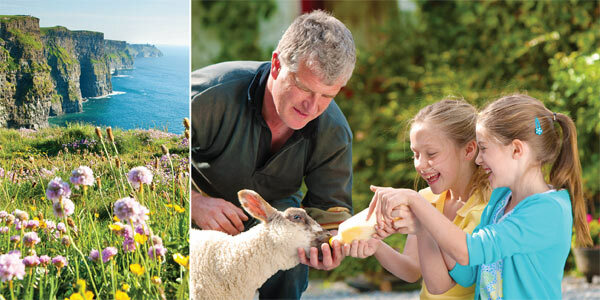 Enjoy a taste of the simple life and spend the morning with your family on a working Irish farm. Learn the secrets of scone making and sheep herding, or try your hand at bottle-feeding a baby lamb or piglet. Then savor a home style lunch complete with freshly baked soda bread served piping hot right out the oven. Celebrate with your fellow Adventurers at a private feast while enjoying the singing of a traditional Irish balladeer. This extravagant dinner party caps off a week of extraordinary experiences! Bid goodbye to all your fellow adventurers, wish them the luck of the Irish, and enjoy one last breakfast in your castle home! Relax and enjoy your final moments in Ireland, as we handle your luggage and arrange for transportation to the Shannon airport.